Gracious God, who called Harriet Starr Cannon and her companions to revive the monastic vocation in the Episcopal Church and to dedicate their lives to you: Grant that we, after their example, may ever surrender ourselves to the revelation of your holy will; through our Lord and Savior Jesus Christ, who lives and reigns with you and the Holy Spirit, one God, for ever and ever. Amen. Harriet Starr Cannon (May 7, 1823--Apr. 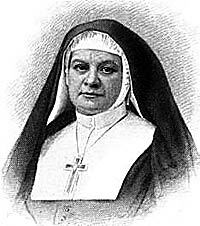 5, 1896) was the first superior of the Sisters of St. Mary, one of the the first orders of Anglican nuns. She was born in Charleston, SC, of parents who had moved there from Connecticut. They died when she was just a year old, so she and her older sister grew up in Bridgeport, Conn., where they lived with relatives. Her sister married and moved to California, and Harriet made plans to move there also, but on the eve of her planned departure, she received word that her sister had died. This crisis was resolved the following year, in 1856, when she joined the Sisters of the Holy Communion in New York, an Episcopal order of deaconesses recently founded by William Augustus Muhlenberg and Anne Ayres. After a few years there, she grew to desire more spirituality in the order, in addition to the work among the poor. So she and a few others left to form a new order, the Sisters of St. Mary. The order was formally founded in 1865 and was dedicated both to prayer and service. Their initial primary areas of service were St. Mary's Free Hospital for Poor Children and the House of Mercy, a home for "wayward" girls and young women. This latter endeavour, after it moved to larger quarters in what is now Inwood Park in Manhattan in 1891, primarily housed girls sent there by the courts for indefinite sentences, and was no stranger to controversy. The Sisters also established a number of schools around the country, and were the "Martyrs of Memphis" during a yellow fever epidemic there. The order expanded rapidly, numbering over 100 by the time of Sr. Harriet's death, in 1896. In its early days, the order was strongly supported by Morgan Dix, rector of Trinity Church, New York, who wrote a short biography of Sr. Harriet at the time of her death.